JetSeal Matte is an advanced paint protection sealant designed specifically for matte finishes. Developed using nano-tech polymers, JetSeal Matte provides up to 12 months of durable protection while creating a brilliant finish. The innovative formula uses UV protection technology that aids in preventing fading and discoloration. JetSeal Matte is the world’s first sealant and paint protection developed for matte paintwork and vinyl surfaces. Advanced sealant formula helps protect against water spots, contamination and road grime to ensure your vehicle is protected all year. JetSeal Matte bonds to the surface using nano polymers to create a shield against the elements. The easy to use formula enhances matte finishes by creating a bold appearance that is protected against the elements. JetSeal Matte creates a protective layer that compliments any matte color. JetSeal Matte was developed over 4 years using aerospace technology to produce a perfect finish and durable protection. Perfect for matte paintwork, wheels, power coat and vinyl wrapped surfaces. Advanced nano-polymers create a hydrophobic shield against the elements. 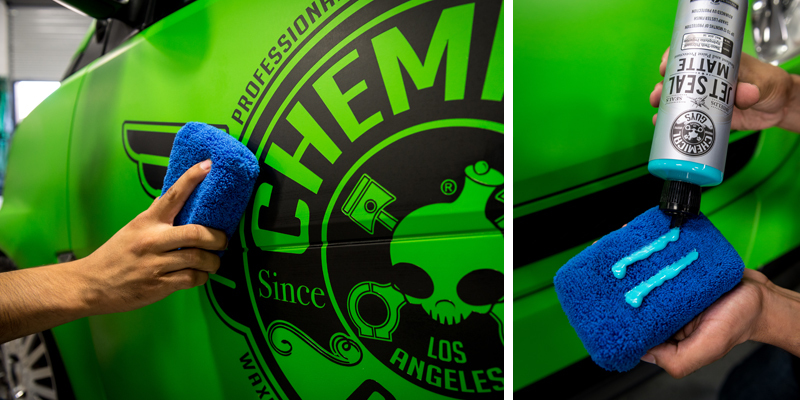 Experience the durable protection and bold finish of Chemical Guys JetSeal Matte. JetSeal Matte is the world’s first protective sealant designed specifically for matte finishes. Matte vehicles require the highest level of protection to prevent stains, fading, and discoloration. JetSeal Matte uses innovation nano-tech polymers to create a durable shield against the elements. JetSeal Matte provides up to 12 months of protection for your matte surfaces. The innovative sealant formula protects against water spots, contamination and discoloration while creating a sharp finish. JetSeal Matte preserves the original appearance of your matte vehicles. Matte surfaces easily become stained and discolored from UV solar rays. JetSeal Matte utilizes advanced UV protection technology that blocks harmful solar rays. The easy to use formula can be applied by hand or machine to virtually any matte surface. The unique polymers inside JetSeal Matte enhance the original appearance of your matte vehicle. Protect and maintain your matte finish for up to 12 months with the innovative JetSeal Matte sealant and paint protection. JetSeal Matte provides durable protection and enhanced appearance to any matte vinyl and painted surfaces. The versatile formula protects OEM matte and frost paintwork equipped on many new automobiles. JetSeal Matte is easy-to-use and can be applied by hand or machine. Simply apply a thin layer of JetSeal Matte to any clean matte surface. 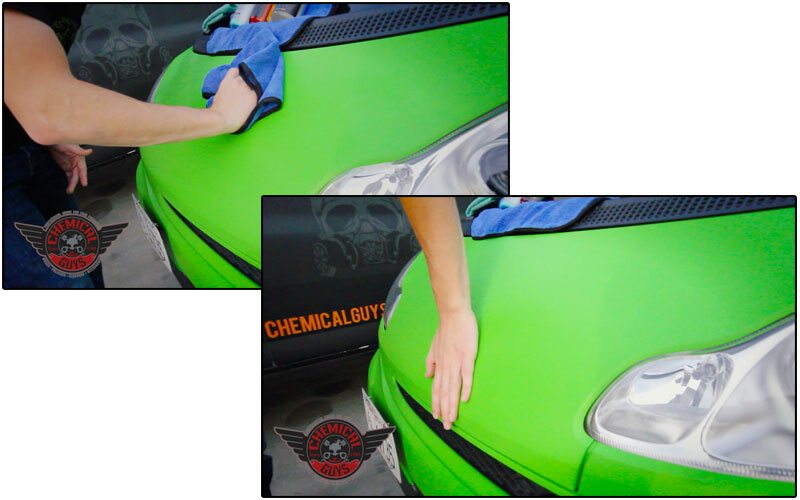 After a 20 minute dry time, simply remove the sealant using a premium microfiber towel to expose a bold matte finish. JetSeal Matte works great on matte paintwork and matte wheels for versatile application on any vehicle. Protect any matte car, truck, motorcycle, RV and even airplanes for up to 12 months. Protect your matte vehicle using the advanced polymer protection of Chemical Guys JetSeal Matte. JetSeal Matte is designed to provide the highest level of protection to any matte vehicle. The advanced nano-tech polymers are formulated to shield and protect matte paintwork and vinyl wrapped surfaces. JetSeal Matte is enhanced with a new advanced polymer that bond to any matte surface to create a durable layer of solid protection. The protective polymer shield protects against UV solar rays, discoloration, water spots and stains. 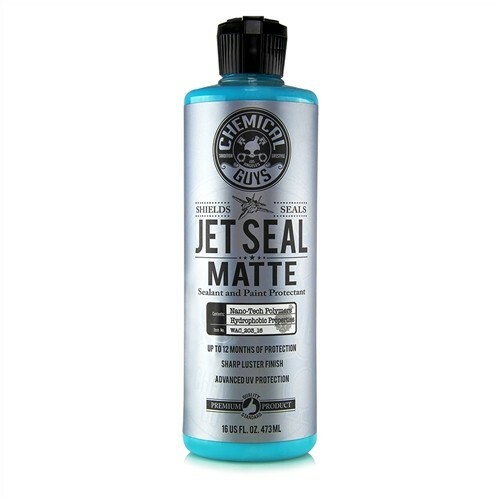 JetSeal Matte was developed using aerospace technology for maximum protection. The innovative sealant is designed to perform in the harshest environments. Protect against the intense desert heat and extreme winter cold using the world’s most durable sealant for matte surfaces.